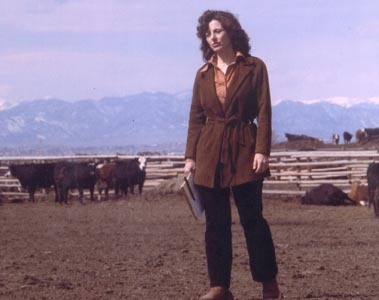 Linda Moulton Howe, Denver, Colorado, developing Home Box Office documentary, UFOs: The E. T. Factor. Photograph © 1983 by Linda Moulton Howe. In 1983, I was working on a Home Box Office TV special called, UFOs: The E. T. Factor. On April 9, 1983, I had a meeting at Kirtland Air Force Base's Office of Special Investigations (AFOSI) in Albuquerque, New Mexico, with an AFOSI Special Agent named Richard C. Doty. Agent Doty showed me an alleged briefing paper for the "President of the United States of America" about "unidentified aerial vehicles" and entities. One of the pages contained a list of locations where American military and intelligence units had retrieved aerial vehicles described as "extraterrestrial," along with humanoid bodies - both dead and alive. In addition to the well known name Roswell, other sites on the crash retrieval list included Magdalena near the Plains of San Agustin; Kingman, Arizona; northern Mexico south of Loredo, Texas; and Aztec, New Mexico. Previous PostPrevious Part 1: “Peculiar Phenomena,” V-2 Rockets – and UFOB Retaliation? Next PostNext Part 3: “Peculiar Phenomena,” V-2 Rockets – and UFOB Retaliation?